I love tea. So much so that I have a whole shelf in my kitchen filled with different kinds of tea. Green tea, black teas, flavoured teas, herbal teas… you name it I probably have it or have at least tried it once. 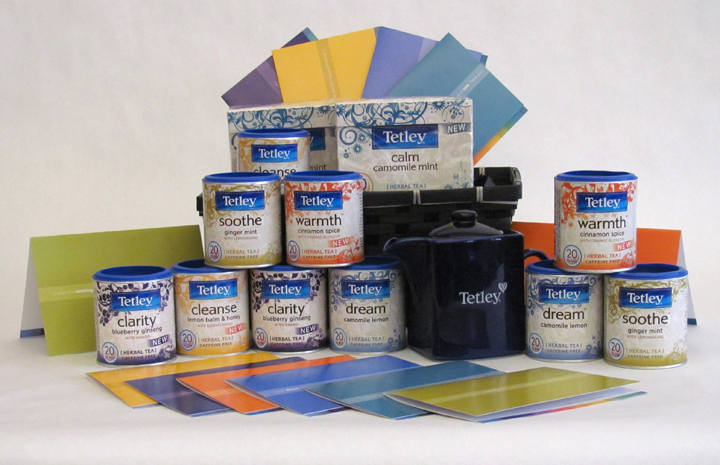 The Tetley Tea company sent me a sample from their new Tetley Colour Therapy herbal tea line to try. Titled “dream,” my sample was chamomile lemon flavoured. The chamomile taste was dominant, while the lemon part was almost non-existent. I have to admit that chamomile isn’t my favourite kind of tea; I actually prefer Tetley’s honey lemon ginseng green tea. Some of the other flavours in the Colour Therapy line look more interesting to me, like the “soothe” (ginger mint) tea. But don’t take my word on the quality of this tea; Tetley is offering my blog readers a chance to try it yourselves by winning a tea basket of your very own. The winner will receive two containers of tea, a canister/tea pot and 50 mood influencing greeting cards. To enter, simply reply below and tell me what kinds of moods you find yourself in when craving a cup of tea. This contest is only open to addresses within Canada only, excluding Quebec. One entry per person only, make sure to include your e-mail address so that I can contact you if you are the winner. Entries will be accepted until end of day January 19, 2011. Ha! I actually had the good luck of winning this from Maki’s blog over at In My Element just recently so I’m not going to be too greedy. Please count me out. Although I will link this to my giveaways page. It was a very lovely tea gift basket indeed. Perfect for all this snowy weather we’ve been getting. By the way, happy 2011 Ms. Brûlée! Thanks, happy 2011 to you too! In the winter I ususally have at least one pot (sometimes two!) of tea a night. I always find that I am looking for contentment after a busy day and the warm liquid is so nice & soothing. It helps me to make the time to relax & recharge my batteries when normally I would be rushing around the house trying to be productive for every single minute of the day! I head to tea when I cold; when I am sad; and when I need an afternoon perk-me-up. Coming from English stock, we do tend to think that a cuppa will always improve the situation. I drink tea everyday—it’s my go to beverage of choice. I look to tea to warm me up on a cold winter day or cool me off in the summer. I love experimenting with different flavors and brands. I have a shelf in my pantry devoted to my numerous teas. I actually have both a tin of the “Warmth” and the “Clarity” and they’re both wonderful! I look for a cup of tea when I want to feel cozy. It’s when I curl up with a book and a blanket to sit for a while. I turn to tea when I feel stressed, or in need of confort. It just works! Tea is my ‘relax’ drink. Goes hand in hand with a good book, nestled up to the fireplace or a calming bubble bath. I find myself craving tea when I’m in need of a warm drink that’s flavor is not nearly as strong as coffee. I don’t think I’ve tried Tetley tea specifically but I usually have family bringing tea from the UK and Asian tea from Asian restaurants. I usually crave tea when I’m feeling relaxed and mellow. i usually enjoy it in the morning after the kids go off to school. I drink tea when I am cold. It is also perfect when I am sick with a little lemon an honey. I love tea and drink a cup (and more) a day. I am a big coffee drinker but there are sometimes that I crave tea over coffee. The mood I am in when craving a pot of tea is usually mid-afternoon, cold outside and looking for comfort food. I am a big fan of herbal tea – grew up drinking Camomille tea when I was sick as a child, so that is what I still do now as an adult. I drink tea when I’m tired, when I’m cold, when I’m relaxing, and when I’m hungry but it’s not quite lunch break yet! Basically I drink tea all the time, and especially like a cup before bed.